First let’s start off with an overview. Now if the ministry that brought death, which was engraved in letters on stone …. And he wrote on the tablets the words of the covenant—the Ten Commandments. That’s clear enough as to what was engraved in stone: the Ten Commandments, which brought the ministry of death (cf. Rom. 3:20, 4:15, 5:13, 5:20-21). Yes, Paul says in 2 Cor. 3:7-18 that the Old Law has a certain level of glory, but it is fading. Those verses in 2 Cor. 3 provide a stark contrast between the two ways: life in Christ through the Spirit in the New Covenant v. life under the fading Law of Moses in the Old Sinai Covenant. After that overview, let’s get into some specifics. The Fourth Commandment orders people to keep the Sabbath (Ex. 20:8-11), usually considered to be not part of moral law, but a ritual. And Ex. 31:14-15 threatens Sabbath breakers with death, which was carried out on one violator (Nu. 15:32-36). The point is that moral law is not optional. Old covenant rituals are. 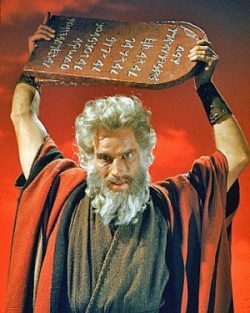 So what about the moral law in the Ten Commandments, considered the horizontal or human-directed laws? Here again the New Covenant Scriptures provide guidance and actually quote some of the Ten Commandments. So if the New Covenant community of believers allows the divine love of God to flow through them, they do not have to focus on and keep the Ten Commandments by the force of their wills. They can fulfill the commands by God’s love. When Christ saves us and we live in the Spirit, the law can be fulfilled in us. 3 For what the law was powerless to do because it was weakened by the flesh, God did by sending his own Son in the likeness of sinful flesh to be a sin offering. And so he condemned sin in the flesh, 4 in order that the righteous requirement of the law might be fully met in us, who do not live according to the flesh but according to the Spirit. The main point is that God declares us righteous in Christ, and then we walk in the Spirit who helps us obey the moral law outside of the Old Sinai Covenant (though the moral law in its Scriptures). Honoring one’s parents, the Fifth Commandment, is a practice that promotes social and domestic peace and harmony, and which people followed long before the Ten Commandments existed and by those who never heard of them. (Think of the ancient Chinese.) Paul affirms the Fifth Commandment (Eph. 6:1-3). Now what about the Second Commandment that says not to make images in the form of anything in heaven, earth, or water (meaning, all-encompassing)? Yes, the Commandment comes in the context of actually worshiping pagan gods, but does it restrict or even forbid great art and sculptures today and throughout the Western history and even the world? Maybe the best answer is modeled on Sabbath keeping. Each one should follow his or her conscience. If we walk in the Spirit, we can do great art. We don’t worship or venerate it from a sinful nature, but enjoy it. In that light, life in the Spirit means we do not gratify our sinful impulses, yet we are not under the law, as seen in the next verse. Note the last clause in v. 18. The “law” in Paul’s writing almost—almost—always refers to the Torah, and the pinnacle of that law is believed to be the Ten Commandments. Again in the last clause, Paul tells the believer to live in the Spirit and rise above the Old Law. Many verses could supplement this study, but the most famous is in Rom. 3:21-31, which says righteousness comes through faith in Christ, not by keeping the law. So do Christians have to ‘keep’ the Ten Commandments? Let’s begin with saying that the ritual command of Sabbath keeping can be followed or not, according to their consciences. And the same goes for drawing, painting and sculpting (image making). Here’s the direct answer to the question. … if they keep them in the context of the (now obsolete) Sinai Covenant, when and where they were originally delivered. … if they anxiously follow a list of negative commands (all of them except honoring parents have a “not” in them. “Thou shalt not!”). … if they try to keep them out of their own will power and self-discipline. (1) They live in God’s love and let it flow through them towards their neighbors and back to God himself. (2) They walk in the Holy Spirit, so that the fruit of the Spirit grows and flows daily, which at the same time weakens the power of their sin nature. So keep them? No. Fulfill them? Yes. Christians, living and walking in those two conditions by God’s power and grace permanently residing in them, “naturally-supernaturally” fulfill the vertical (God-directed) Commandments and the horizontal (human-directed) Commandments. And they can receive instant forgiveness when they obey their sin nature and break them (e.g adultery), without fear of punishment from a ‘vengeful’ God. It all begins with God’s love and grace in the first place. The whole issue is answered through new life in Christ within the never-obsolete, eternal New Covenant. This entry was posted in Bible and Theology, Biblical Ethics and Policies and tagged Christians and the Ten Commandments, Do Christians have to keep the Ten Commandments? by james malcolm. Bookmark the permalink.